When Americans go out to drive, they pick the fastest, emptiest, easiest roads available. Jalopnik readers have put together their favorite driving hot spots in the country. The best place to go fast is, without question, in a video game or on the racetrack. The public roads are lined with walls barriers, trees, and innocent other drivers. If you really want to get your top speed kicks, we have two guides to the cheapest racetracks in the country. Beyond that, get your shits and giggles out in Forza or Gran Turismo before you end up wrapped around a tree. Still, some readers like to pick up a little extra speed and have chosen these stretches of road as their favorites. Why are we sticking to US (and Canadian) roads? It's nice to know that on a particular stretch of Germany's A81 Autobahn leading to the Austrian border you can go as fast as you want, but they're slightly out of reach to the average gearhead. We'd all love to drive the deserted highways of central Australia, the E6 in Norway, or the Wangan, but it's not accessible for most readers. Anything we've forgotten? Sound off in Kinja. This is a highway designed for hurricane evacuation and our readers say that cops are out there in force, but if you go out when football is on (especially Auburn/Opelika and Birmingham/Tuscaloosa), all the troopers tend to be working the game. This stretch of highway between San Francisco and LA is lined with meat packing plants. It smells TERRIBLE. The roads are straight, but our readers say they've never seen a cop camped out in "Cowschwitz." Usually, this highway is jam packed. Our readers say that after 10 pm the thing is clear. It was built to serve Dallas' humongous driving population, so there's usually lots of room. Since it's built like a concrete canyon, our readers suggest there are few places for cops to hide. The place to be is between Stroudsburg and Bethlehem. Our readers say that there are hardly ever cops on this road, but if there are, one could see them a good mile and a half away. Average speeds are about 80, but our readers have seen people going faster. The roads of Wichita are completely flat, straight, and smooth. Our readers say that you can loop the city on I-235/K-96/I-135 and only see cops regularly on the southern portion of 235. Head south out of Chicago and you'll find miles of well-maintained, flowing highways. Cops are scarce, say our readers, we. Alberta used to be the place for high-speed driving in Canada, but the police presence has allegedly increased there. It's still the old cops-munching-donuts system in SK, say our readers, and they insist between the towns in the middle of nowhere there's plenty of room. Nevada Highway Patrol is usually looking for truckers shortcutting weigh stations, so they rarely camp out to catch speeders, say our readers. This leaves them with long two-lane roads, straight and flat with no exits. Highway 93 is our readers' favorite. Get out between Salina and Green River and you are in Bumfuck, Nowhere. This is the longest distance anywhere in the interstate highway system with no motorist services. Out of the 100 mile stretch you have about 80 miles of empty road. Our readers say it's a nice place for those who suffer from Hagar's disease. 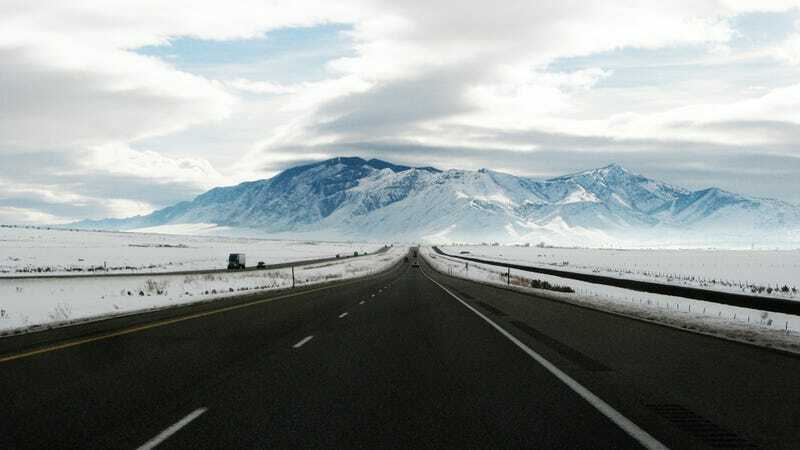 Highway 50 is the loneliest road in America and if our readers were trying to get a little extra speed they said they would head out to Delta, south of Salt Lake City, and head west until they got to Black Horse, a ghost town. It's 100 miles of the biggest, emptiest land in the country. After all this we still will honestly say that you should go find a track day, drag strip, or autocross near you if you want to go fast.